Medical cannabis is making its way out of the haze and into the headlines as expanded research programs demonstrate its proven benefits. Some of the most recognized applications of cannabinoid-based medicine are in the treatment of neuropathic pain, inflammation and muscle spasticity. These pronounced analgesic and anti-inflammatory properties have inspired emerging studies into cannabis’s potential applications for women’s health. It is estimated that at least 20% of women globally suffer from chronic gynecological illness, for example endometriosis, dysmenorrhea, polycystic ovarian syndrome and fibroids, to name a few. Despite the prevalence of these often painful and incurable disorders, funding for research is limited. The research gap in women’s health is part of a larger picture: despite strides in improving the status of women globally, health care inequality remains an ongoing challenge. However, this is slowly changing. Recently there has been a surge of interest and funding for women’s health-related research. In particular, research and development for cannabis-based therapies targeting women’s health challenges is making headway. The female reproductive system has the highest concentration of endocannabinoid receptors after the human brain, making it particularly receptive to cannabis-based therapies. In fact, since antiquity cannabis has been traditionally used for treating female medical conditions. From ancient Mesopotamia to Victorian England, women throughout history have found relief from menstrual discomfort, endometriosis, contractions, and hormone-related nausea with cannabis. 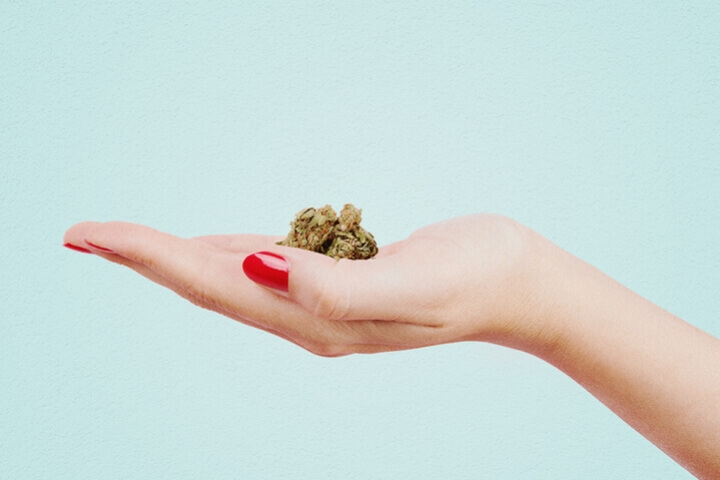 While cannabis prohibition halted the development of medical cannabis treatment options for women, this trend has reversed and is quickly making up for lost time. One of the world leaders in this field is the Lumir Lab at the Hebrew University of Jerusalem. Funded by Israeli investment firm, Asana Bio Group Ltd., the lab provides clinical trial services for medical cannabis product development relating to women’s health. In their first joint study with Israeli start-up Gynica, the Lumir Lab is investigating the use of cannabinoids in the treatment of endometriosis. Endometriosis occurs when uterine tissue migrates from the uterus to other parts of the body and affects an estimated 180 million women worldwide. Although there is anecdotal evidence supporting the use of cannabis in reducing symptoms and even preventing the spread of the disease, prohibitive attitudes towards researching cannabis have stalled progress. These attitudes, however, are changing. This shift and the resulting increase in clinical research in gynecological applications from PMS to menopause, has the potential to improve quality of life and long-term health outcomes for millions of women worldwide. Another company breaking down barriers is Foria, a Colorado-based hemp product company focusing on CBD-derived wellness solutions for women. With unique formulations and novel delivery mechanisms, Foria offers a range of elixirs, vapor liquids, suppositories and lubricants designed for women and addressing a wide range of health challenges. With a growing fan base, especially for their intimate products targeting sexual discomfort and libido enhancement, Foria is bringing cannabis out of the closet and into the bedroom. The underrepresentation of women’s health related research and product development has negatively impacted women and abandoned them to inefficient and sometimes painful interventions. Alternatively, women also opt to self-medicate with cannabis. While this is a common trend among chronic pain and inflammation sufferers, women have also been found to use cannabis to relieve anxiety and depression associated with sexual trauma. Clinical studies have demonstrated the efficacy of cannabis in mitigating the symptoms of PTSD in military veterans, however studies uniquely investigating women with PTSD generating from sexual trauma have been far less popular. Hopefully, this research gap will soon be reduced and the psychological and physical health needs of women addressed. In the rapidly expanding medical cannabis ecosystem, research and development is placing women’s health front and center. While there is still a long road to travel, both in the maximization of cannabis research and medicine, and in addressing health-related gender inequality, medical cannabis companies are quickly recognizing the importance of developing woman-specific products and therapies. Increased woman-centered research funding is the first step down this road. At CannaTech Tel Aviv 2019, we will be showcasing some of the world’s leaders in medical cannabis research and development We look forward to joining this journey, and hope that you will join us as well.